​Maserati presents its most complete and ultimately upgraded product portfolio at IAA Cars 2017 in Frankfurt. Starting from the new Ghibli, which has adopted a new range strategy and features a significant exterior restyling, all Maserati models have been thoroughly upgraded, adopting additional high-tech contents. The iconic GranTurismo and GranCabrio MY18 have been elegantly restyled for improved aerodynamic performance, while featuring an upgraded interior with brand new driver interface and state-of-the art infotainment system. The new Ghibli sports sedan - the best-selling vehicle in the history of Maserati with over 70,000 cars delivered in 70 countries since 2013 – makes its European Premiere at IAA Cars 2017 featuring a significant exterior restyling and a rich array of hi-tech contents. Two new distinctive trims, GranLusso and GranSport, have been included in the model range, following a strategy inaugurated by the Quattroporte in 2016. Each trim uses its own voice to bring out the elegance and sporty performance unique to Maserati. Faithful to its DNA, the new Ghibli range offers unmistakable class, top-quality performance and a stylish yet comfortable driving experience. In 2016, the launch of the Levante, the first ever SUV in the over 100-year history of Maserati, was a turning point for the Trident, introducing it into the world’s largest luxury segment. At IAA Cars 2017, Maserati presents the Levante MY18 that has adopted a new range strategy with two distinct new trims: the luxury-orientated GranLusso and the red-blooded GranSport. The Quattroporte MY18 makes its debut in Frankfurt with significant upgrades and new high-tech contents, aiming to carry on its success story for the years to come. The headlights have adopted Adaptive full LED technology that provides remarkably better visibility, cooler light, glare-free high beam functionality and double extended lamp life. The brand-defining GranTurismo and GranCabrio models have received a substantial refresh for MY18, introducing an elegant and aerodynamically efficient restyling, improved ergonomics and a state-of-the art infotainment system. The timeless Pininfarina design was treated with the utmost respect by the Maserati Design Centre in the restyling process, benefiting the aerodynamic efficiency of the four-seater coupė and cabriolet. As a result, the aerodynamic drag has been reduced from 0.33 to 0.32 for the GranTurismo and from 0.35 to 0.33 for the GranCabrio. The streamlined range of each model comprises two distinct versions, Sport and MC, both equipped with the naturally aspirated 4.7L V8 engine, producing 460 hp, 520 Nm peak torque and breathtaking Maserati-signature sound. The interior of the GranTurismo and GranCabrio offers unparalleled comfort for four adults thanks to the individual Poltrona Frau® leather seats with integrated headrests. For 2018, the sumptuous interior features a new, high resolution 8.4” capacitive touch screen and refined ergonomics. The state-of-the art infotainment system is combined with standard Harman Kardon Premium Sound system and the interior features a redesigned lower console accommodating a user-friendly double rotary knob. Continuing its prestigious partnership with Maserati, Bulgari has created two new Octo Maserati watch models and reveals them officially at IAA Cars 2017. The new Octo Maserati GranLusso and GranSport by Bulgari are firmly focused on exclusivity and reserved for Maserati owners. They feature retrograde minutes and jumping hours displays with a spectacular dial effect intended to recall the rev counter of a real Maserati, along with topstitched leather strap reminiscent of Maserati upholstery. 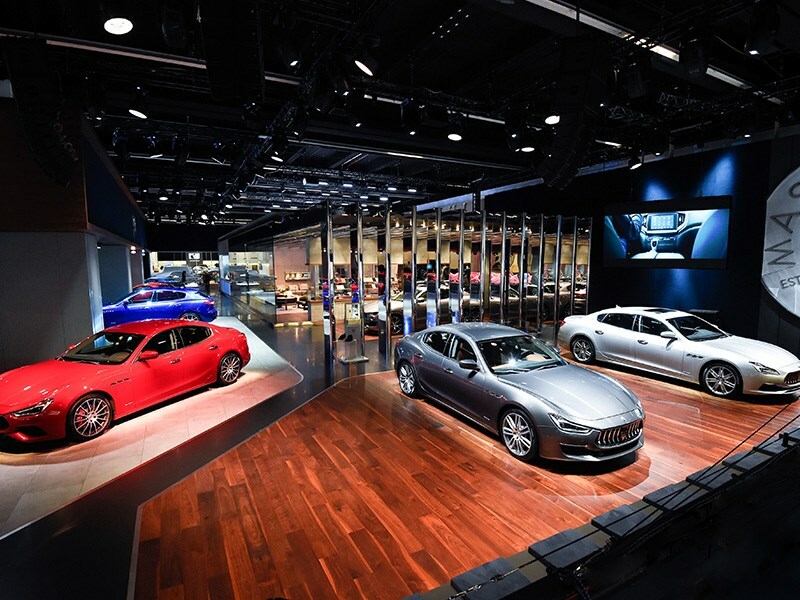 Maserati and Ermenegildo Zegna are pleased to present at Frankfurt Motor Show the new Maserati Capsule Collection inspired by the GranLusso trim, featuring a dedicated Ermenegildo Zegna fabric, now available for Ghibli, Levante and Quattroporte models. FCA Bank is a financial institution engaging mainly in car financing, with the objective of meeting all Maserati clients’ mobility requirements. The bank operates on the main European markets with a sole mission: supporting the sales of prestigious European brands with innovative financial loan and leasing programmes completed with high added value services specifically designed for the sale networks, for private customers and corporate fleets.